1924-P MS64 Peace Silver Dollar $1, NGC Graded, Colorful Toned! 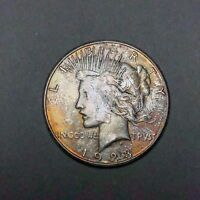 1924-S Peace Dollar, Better Date Silver Dollar, Choice BU++/Near Gem * Free S/H! Great, but Watch Out for Negative 'Prismatic Refraction' Issues. This was in good condition. It was a nice addition to my collection. These are great because they have a silver value and a historic value. I give these out as rewards when I catch my employees doing something extraordinary. It's only for personal appreciation and a significant year to my family! The study of the entire series of US Peace Dollars could keep one occupied for a very long time. For example the lady on the obverse side of the dollar was named Ellen. She was much prettier I'm happy to say than the poor as in a sympathetic way appearance of her portrayal on the coin itself. This brief synopsis of the the years 1921-1935 production of these Peace Dollars I hope would encourage and enhance the fine art of proper coin collecting. And thanks for allowing this review of this item purchased on Ebay. A brilliant old Peace silver dollar. It is in excellent shape and I'm very happy with it. This coin has hardly if any bag marks and is Graded by one of the most respected 3rd party grading company's around.